What do investors want, and how can you satisfy them? In this context, by “investors” I mean professional managers of (mostly) other people’s money, that move millions at a time — not retail savers like most of us with thousands in a retirement account. Investors want predictable returns that match the risk-weighted expectations for the portfolios they manage. Every type of investor has a certain risk profile and horizon over which want to achieve returns. And that rate of return will always be compared against some benchmark, hurdle rate, or previous high water mark. Risk-weighted expected returns are negative here. In equity investments, return on capital comes from share price appreciation and dividends. Recently share buybacks have become a hot topic, as an alternative means of returning excess earnings to investors (instead of dividends), but let’s leave that aside for now (instead, read what Matt Levine has written about it). The new theory views public markets as a way to return capital to early stage private investors — again, out of scope for this post. From this point, let’s narrow the scenario: you are a leader at a publicly traded company. With stock that trades on the public markets, you need to know what kind of returns your investors want. Index funds, representing a large share but not the majority of equity investors, want the index, which is an aggregate of the prices of the individual stocks in the index, to rise at some multiple of inflation. Some investors speculate on companies being acquired at a premium. Any “long” investor wants prices to grow over time. For a given P/E ratio, earnings growth gets you price growth. Higher earnings growth, sustained over enough reporting periods to establish a new expectation, can command a higher P/E ratio and therefore a greater rate of return on the same annual earnings growth rate. Drilling down another level, the best way to achieve earnings growth is through revenue growth at constant margins. I say “the best” because revenue has no practical upper limit for a single company, while cutting costs to grow earnings will eventually run out of costs to cut. Revenue growth at constant margins isn’t easy — it’s the stuff careers are made of, or broken by. I’m fortunate that my entire career has been devoted helping companies achieve more profitable growth, either as a consultant or manager, in both “old tech” and “new tech” industries. I am constantly learning from my direct experiences and case studies of other businesses. Some industries, like energy, healthcare, and FMCG, require significant capital investment across complex global supply chains. Timing these investments within business cycles, maximizing returns of a capital projects portfolio, and pursuing operational excellence are essential in saturated markets with low levels of consumer loyalty and commoditized offerings. The tech industry contains a different set of growth challenges with different economics: achieving product/market fit then scaling up investment in sales, marketing, support, and infrastructure. Growing markets, loyal (or fickle) consumers, fierce competition for talent and regulatory uncertainty provide endless alternative scenarios for management teams to evaluate when making decisions. So, when determining what strategy to execute, what projects and initiatives to fund, and generally where to focus your scarce leadership attention, first understand what your investors want based on their expectations for risk-adjusted returns. Whether your organization is an oil & gas major or an elementary school, making smart investment decisions and managing the performance of a portfolio of projects is essential to maximize returns on limited resources. Hopefully you have better investment screening rigor than Kramer. But how clearly can you articulate the relative performance of your investment options? Should you cancel an in-flight project that is underperforming, and redirect the resources? The two essential charts below should be included in any executive dashboard for portfolio project management in any organization, regardless of mission or industry. 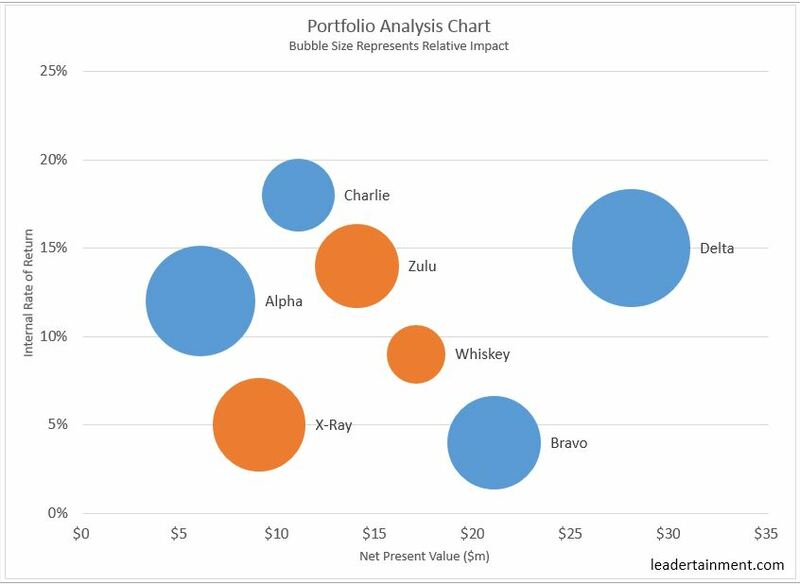 Portfolio Analysis Bubble Chart: The two axes on this chart are NPV (Net Present Value, which is the expected future returns minus investments, discounted to today’s value) and IRR (Internal Rate of Return, which is the rate by which you’d have to discount the future returns to equal zero today). Accounting jargon aside, the chart compares the magnitude and efficiency of investments. The third component, bubble size, could be anything that is appropriate for the organization (in this example, something really specific like “impact to stakeholders”). You want to select the big bubbles in the top right corner that have large, efficient returns. pre- and post-money options on the same chart (in different colors), and you can inform a decision to sell or wind down a current project in favor of a more favorable option. 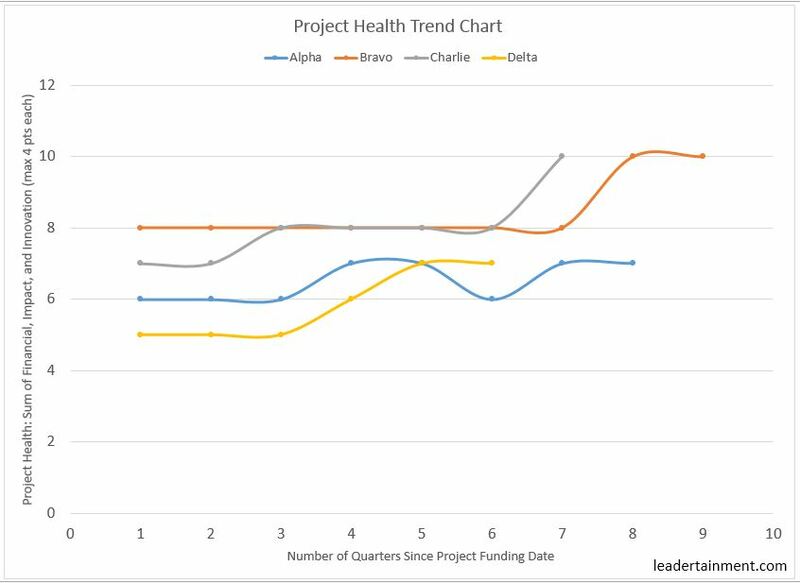 Project Health Trend Chart: A snapshot of any portfolio of projects could be misleading if your projects tend to have large up-front costs and generate returns towards the end of their life. This chart measures the performance of projects on an arbitrary 12 point scale: 4 points each for 3 factors (in this example, financial health, impact, and innovation). By plotting this score for each project on intervals from their start dates, a leadership team can make both absolute and relative comparisons. What other charts would you include in your “desert island” project portfolio management package? Have you used either of these? Leave a comment with your questions and feedback. There are only 4 jobs in business: which are you pursuing? Here’s a quick post to summarize a conversation I had a few weeks ago about my own career path (thanks, Michael Schreck). Hopefully, this framework will be useful for other people exploring career development options. At some point in our careers, we must choose to specialize. For some people this occurs very early, for example entering an apprenticeship at age 16 to learn a skilled trade. Others make this decision after working in the same functional role across industries, or in different functional roles in the same industry, or after a stint in consulting. Fund raisers: These people raise funds to support transactions and investments, typically through private equity funds, hedge funds, exchange traded funds (ETFs), mutual funds, or debt/equity offerings. You will succeed in this job if you love building pitch books, are already a famous and massively wealthy investor, and/or are such a fantastic salesperson that you can convince people to part with millions of dollars for the chance to own a sliver of something that won’t exist for years. Deal makers: Once the funds have been raised, it’s time to put the dry powder to use by buying something. While many corporate development teams, venture capital & private equity groups manage deal flow and close transactions on their own, the deal makers that grab the largest share of the spotlight are investment bankers. Spending an unsustainable percentage of your life revising pitch decks is also a hallmark of this career path. but for those who succeed in riding the M&A waves, countless bespoke suits and limited edition watches await. Profit takers: Once the fireworks around the deal have faded, someone’s got to execute the strategy. The owners of any business, ranging from a sole proprietorship to a limited liability company to a corporation, bear the risk of the ongoing operation, and also have the first cut of the retained earnings. [Updated thanks to a helpful comment by Pete Bondi] The owner’s role is to create: new products, services, and content that attract customers and retain competitive advantage. Recent studies show that most CEOs of large corporations have finance backgrounds, and all have had to climb the ladder by succeeding in operational and sales roles, in addition to any functional experience. US tax return data shows that higher earners are more likely to be self-employed, so the appeal of “owning something” can also be quite lucrative. Advisors: After some feedback and discussion about this post, I’ve added a fourth category to include career consultants. Now anyone who has run a consulting business would put themselves in the third category above, but there are plenty of talented people who can lead long, fulfilling careers as non-partner, subject matter experts on the consulting track, without ever participating in the execution of their analyses. Which path are you on? Why? Are you at an inflection point in your professional development? Sometimes eliminating an alternate path can help increase dedication to the path you’re on – so take a good hard look at the grass on the other side of the fence and make your decision.